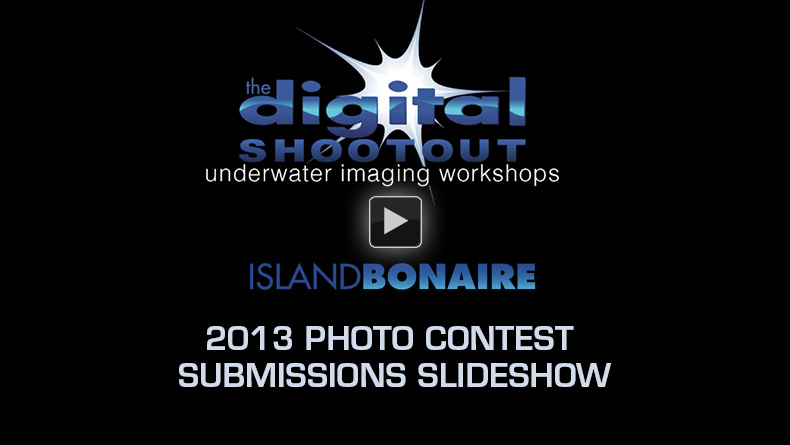 The Digital Shootout is THE ultimate working vacation for underwater photographers. 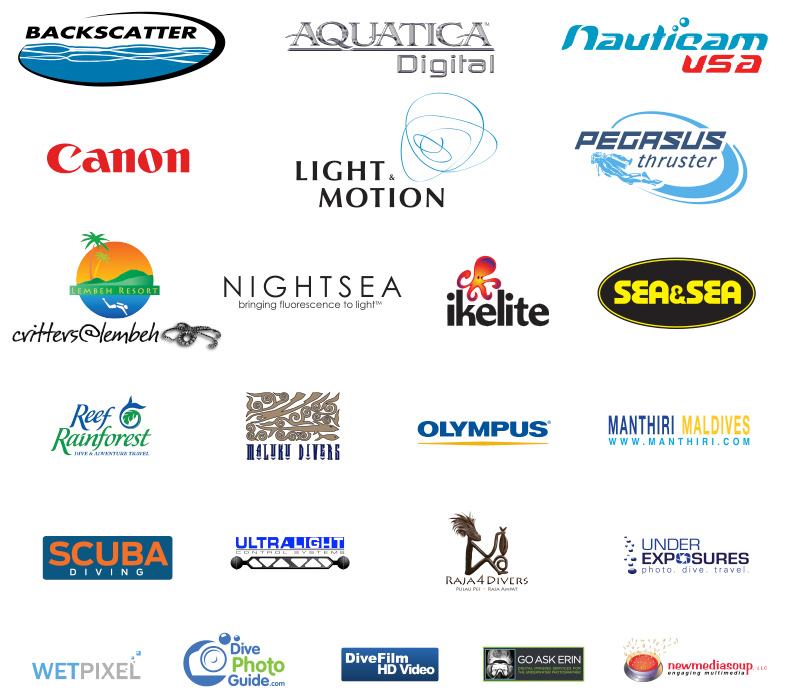 Nowhere else can you gather with other like-minded image makers to dive, learn and have a blast doing it! The daily schedule, not for the feint of heart, goes something like this: Seminars, Diving, Evening Slide Show with Critiques, More Diving (optional). Somewhere within that daily schedule are 3 meals, time to edit your images and time to set-up your rig for the next dive. 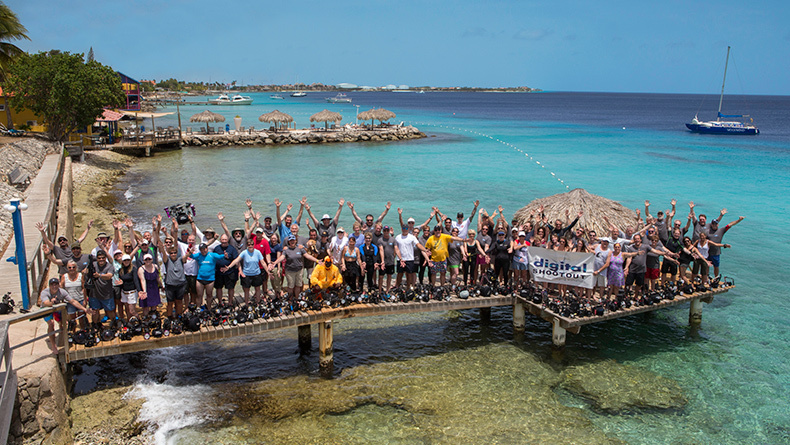 Some of the really motivated participants would even seek out extra small group or one-on-one post processing help and/or go on multiple night dives. If you love what you do, then it's not work! 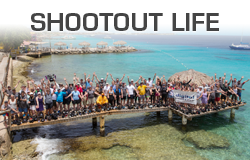 While the Shootout can be a high octane atmosphere, it is also vacation, so if we DID see you playing hooky from a seminar, lazing by the pool or getting a massage, it's A-OK! If you've been itching to get your hands on a new housing to take it for a test spin, been dying to try some larger strobes, wanna see first-hand what the fuss is all about regarding the lights for fluorescence photography or just want to talk gear, then this is the place for you! Between the Backscatter Staff and all of the manufacturer's reps, we brought a huge amount of gear to this year's Digital Shootout. The Backscatter Crew (Jim, Sterling, Fred and Sean), Chris from Nauticam, Jean and Sean from Aquatica, Paul, Charlie and Jeff from Sola NightSea, Ed from Canon and Marissa from Pegasus Thruster, all made themselves available to teach, guide or answer questions about gear round the clock. 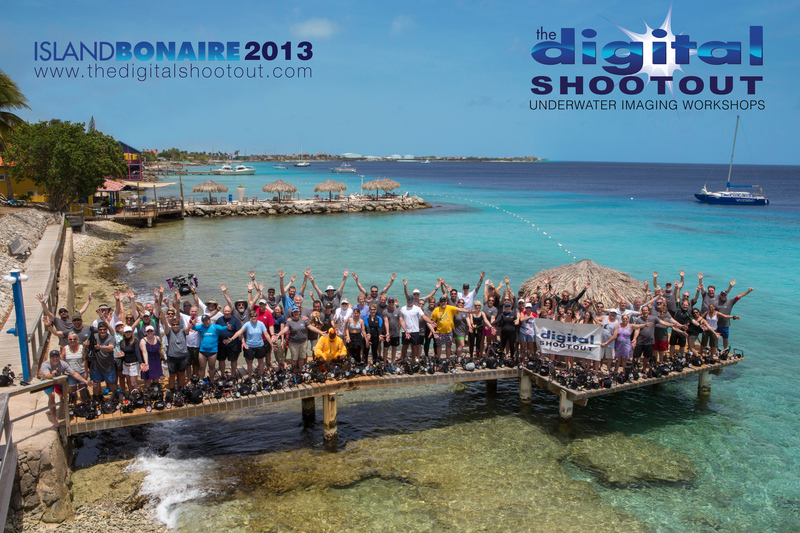 Without their tireless efforts, The Digital Shootout would not be the premiere event that it is. Hats off! 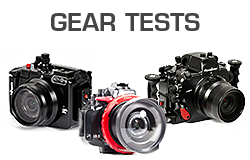 See the latest cameras in action on our gear test page. One of the main focuses of the Digital Shootout is the learning aspect. Yes, there is world-class diving. 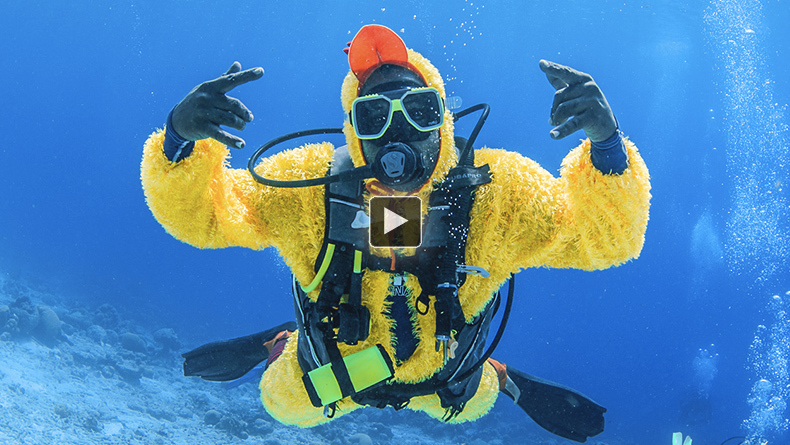 Yes, it is underwater gear-centric for the gear-geek in all of us. But it really is all about learning to improve your photography or videography in water, and out of water. The teaching pros - Berkley White, Erin Quigley, Mary Lynn Price and Sterling Zumbrunn - are not only passionate about underwater imaging, but they LOVE to teach, especially when surrounded by motivated, up-and-coming shooters. Alone, each is a wealth of knowledge. Collectively, they are an amazing and invaluable resource to us all. With our new schedule, it was just like going back to school with that 8:00AM bell. Berkley kicked off the week's seminars with Underwater Photography Techniques, sharing the vital importance of critical focus and proper exposure for your images, and how proper lighting can either make or break an image. Underwater Video Techniques covered Berkley's tips and tricks for acquiring in-focus, white balanced, stable and properly exposed video underwater (hmmm, many of the techniques are the same for shooting stills and shooting video…). Once we've shot a few stills, what do we do with them next? Erin Quigley, aka: GoAskErin, covered Adobe Lightroom basics, from importing your images, to cataloging and organizing them, to basic editing of white balance, exposure and cropping, and even more advanced localized editing using brush tools, masks and graduated filters. Lightroom being a very popular popular topic, Erin also shared her knowledge in small group sessions and one-on-one with participants who showed extra interest - The Creative Cave, this year's Help Desk location, was always buzzing with a line out the door! Since the majority of the cameras on the market today have video capability, we've seen the number of participants shooting video increase exponentially. Video Editing Basics, taught by Mary Lynn Price, is the bread and butter of video editing for those just getting started, and for the video shooters with some experience under their belts, there's always a few nuggets of wisdom to be acquired in this class! MLP manned the video portion of the Help Desk, and could be found in The Creative Cave cheering on her students. To change up the scenery, Berkley taught a class on shooting splits, images half underwater and half above water. Speaking first on technique and showing examples in the classroom, he then moved the class to the lagoon for an in-water teaching session where a few volunteers graciously posed as subjects to shoot - special thanks to Seanna for being such a good sport! Back in the classroom, Sterling Zumbrunn shared with the class the various ways to share your images via the web. Through services like Flickr, Google+ or Dropbox, now everyone with a camera and a computer can share their images with family and friends with their easy to use solutions. And on the boats, Joel and Jen gave an informal session on Your Dive Buddy, Your Model, sharing their tips on how a buddy team of photographers can actually model for each other. For the past few Shootouts, we have had the pleasure of Ed Meyers from Canon joining our party. We are thrilled and grateful for Ed, not only for his wealth of camera knowledge and gear to demo, but also because he painstakingly drags his pro level Pixma printer, high quality photo paper and inks with him to the Shootout to print YOUR images on-site. Very cool, Ed! You da' man! And not to be overlooked, all of the gear techies - Jim, Fred, Sterling, Sean from Backscatter, Jean and Sean from Aquatica, Chris from Nauticam, Paul from Light&Motion, Charlie and Jeff from NightSea and Marissa from Pegasus Thruster - were nearly in the classroom all-hours to assist with set-up or to solve a problem, with the goal to keep you shooting all week long. This year, we changed up the format of the nightly slideshow by keeping submissions anonymous, and by including examples of post processing on a few of the images. 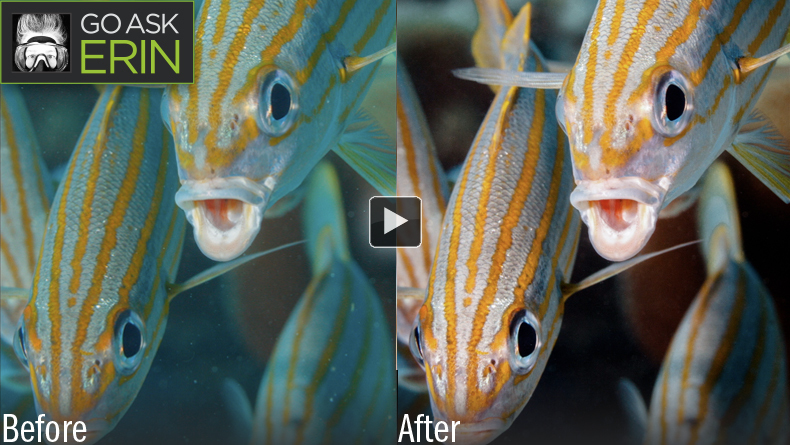 Here's a sampling of Before and Afters from the 2013 DSO slideshow critiques. 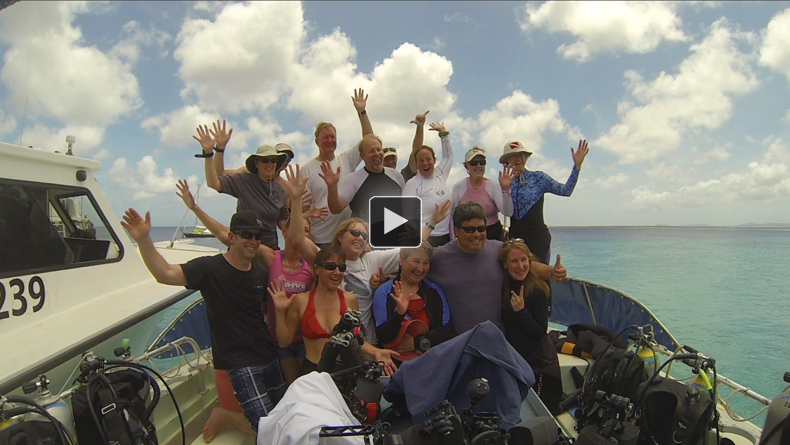 It was another great year for video editing at this year's Shootout in Bonaire! A number of participants produced their very first edited videos ever, and many of the more experienced videographers tried new creative imaging techniques and editing approaches. The guests we're able to connect with staff that were shooting everything from Epic 5K, to DSLR, to GoPro and iPhone. Regardless of the camera, editing is always required. A total of seven different video editing programs were used this year. Several imagers edited their first videos in Apple's Final Cut Pro X, and a number of more experienced video editors moved up to Final Cut Pro X from FCP7 and iMovie. The winning videos displayed strong efforts to tell stories, both personal and environmental. A comedy entry was a big hit with the awards show audience; and a creatively edited video shot with fluorescent equipment was a winner in the NightSea fluorescent imaging category. We had a number of videos entered into the week-ending, friendly competition! Enjoy the scenic underwater views from our participants! Every year we try to downplay the week-ending competition, but the allure of such fab prizes makes it tough for everyone to put it out of their mind. 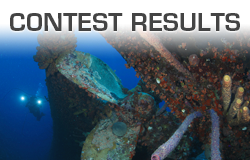 Who wouldn't want to win a gift certificate to the largest underwater video and photo store (basically the same as cash!)? Who wouldn't want to win state-of-the-art gear, or even a dive trip to a tropical location? So it's easy to see why there's a spotlight on the competition… The judges fought long and hard, arguing for their top picks, until decisions were made (5 hours later!). Their final picks all met this criteria: Would I want to hang this image on my wall? Would I want to share this video with my friends and family? Spreading the wealth, where each winner may take home his/her one favorite prize with the remainder going into the raffle, has been a mainstay of the Shootout. But high-fives and fist-bumps deservedly go out to everyone who participated in this year's Shootout! You all worked diligently, and hopefully, you learned a few things and saw marked improvement in your image taking and image making. Well done! We couldn't do it without our amazing sponsors! Here are all of the images that were submitted for the week-ending competition of this year's Digital Shootout.